why cats are afraid of water? Not all cats are afraid of water. 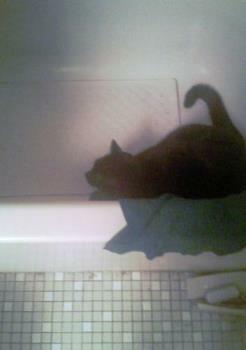 Take my cat little bit for example, He likes to sit in the tub and lick the watter right out of the tub. He will also lick water right off my hand and he'll also come up to the edge of the tub when I'm taking a bath. He has on a couple of occassions even jumped on the edge of the tub to drink out of it when I'm bathing in it. At one point, he's even come when the water is running. I don't think cats in general fear water itself, as they are afraid of the sound running water makes. My cats like water just fine except when the tub or sink is filling. I totally agree that cats don't really fear water, I think that it might have a LOT to do with their body temperature and the fine hair they have. If you look at "water" dogs, they have a coarser oilier hair while cat's hair is finer, softer, and doesn't have the oil content that the dogs do. Part of dog's buoyancy is that oil content. My cat Smyles loves water. As a matter of fact he jumps into the shower with me. He loves getting wet. He only jumps in the shower with me and not my husband. He is strange, but cute. It isn't so much that cats are afraid of water, it is that they weren't physically developed to be swimmers. Their fur is soft and not as oily and dense as dogs, and they would suffer from hypothermia fast. Cats also don't have the webbing in their feet to be able to move the water as efficiently as dogs do the cat's paws were built for climbing so there isn't the extent of webbing between the toes for many of the things that dogs do...but of course dogs usually don't climb trees either. Cats are defenseless in the water, and if attacked by a predator they wouldn't be able to defend themselves. Since they aren't avid swimmers they wouldn't be able to swim any amount of distances and they would drown. Also, they can and will swim and there are some breeds of cats that do like water. I had a Siamese who loved taking bubble baths. I also had one who loved for me to give him baths and he would demand them. I just wouldn't have the water overly deep. Are really cats afraid of water, this is the first time I am hearing sucha thing. I have seen many cats moving around water and drinking it from the bucket. Never thought that they were afraid of it. Not all cats are afraid of water, I've actually known a few that liked it.